Marshall Honeyman’s deep experience in patent prosecution and focus on technology adds value to Erise IP’s client services. Marshall focuses on advising Erise’s high-technology clients in the area of patent prosecution. Prior to joining Erise, his experience as an intellectual property attorney includes serving as a firm partner as well as working in the USPTO (United States Patent and Trademark Office) as a patent examiner and then as an Associate Solicitor. His background also includes serving as an ADA (Assistant District Attorney) for the 18th Judicial District in Wichita, Kansas. There, he litigated a wide range of felony criminal cases. During his time at the USPTO, Marshall reviewed and acted on patent applications directed to, inter alia, lighting arrangements and devices, computer display light guides, fiber optics, LED arrays and complex automobile headlamp configurations. As an associate solicitor, he handled law suits brought against the USPTO as well as ex parte appeals to the Court of Appeals for the Federal Circuit. Additionally, he co-managed the section of attorneys responsible for litigating disciplinary actions against patent practitioners. 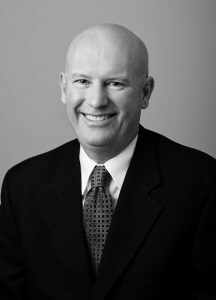 He regularly represents clients in complex intellectual property matters, and his previous matters include defending the USPTO Commissioner as lead briefing attorney in BlackLight Power Inc. v. Rogan, and he also litigated disciplinary complaints against patent practitioners on behalf of the Director of the USPTO Office of Enrollment and Discipline. Additionally, he served as lead attorney on ex parte appeals to the Federal Circuit. Marshall is registered to practice before the U.S. Patent and Trademark Office, and he is admitted to practice before the state courts of Kansas and Missouri.